$15.99 to $359.99 & FREE Shipping on orders over $59 $35. A standard length and diameter single punch cork in a high quality grading at a reasonable price. 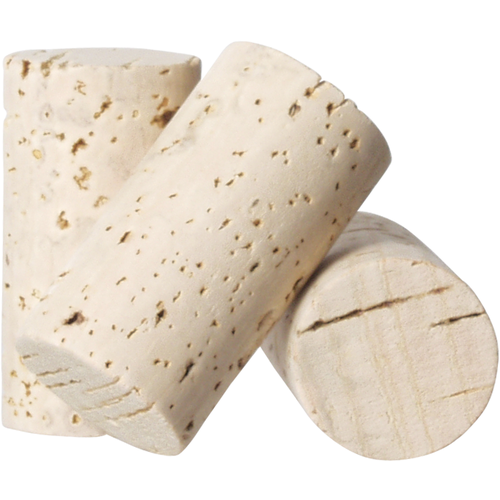 Corks are typically graded on a scale of 1-10, 1 being the best score, based on the degree of porousness that the actual punch of cork exhibits. Cork trees that show a higher population of worms or fungi tend to yield cork crops which are more porous. The Grade 3 corks show less than average porousness and are on par with the quality of cork used in many commercial facilities. Grade 1 & 2 corks are almost completely solid and sell at very high prices. These corks are harvested and punched in Portugal, like the majority of the rest of the corks available today. They are processed, sorted, prepped and packaged here in Northern California. quality corks can save your wine! I've been using these corks for years, only one leaker in hundreds used! Used them before and they were good. I bought these before, and they were really nice corks. 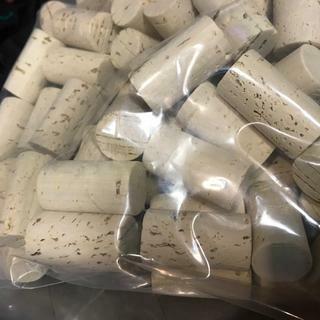 excellent quality corks; I have bottles that are over 10 years old with these corks and no leaks or ullage if kept in a proper cellar. Grade 3 for a good price. Wanted corks that would be able to age wine for at least 5 years. Because I didn' need a thousand. No real reason just like natural cork. Using for wine that will age 1-2 years. I want a good cork that will last up to 5 years in the bottle. Good price and I will be aging some reds for several years. i've used them in the past and they are great. I have never had wine go bad and have stored for up to 5 years. I use a floor corker and look at each cork. I always put the nice end against the wine. Very few corks are not good enough. I wish they were sold in 1000 cork lots but bagged a hundred per bag. Good corks with the right 'corker'. Received the corks in good order. Placed them in the 'corker' pulled the handle and corked the bottle. Smooth operation. Good corks. I am using the Portuguese Table Top Corker (RED). Item # W408. I am thoroughly satisfied with both products! tried using these with my hand corker and they are terrible. The tops crush and then break. Satisfied with product and it worked very well . Haven't had any issues since I switched to a floor corker, the hand corker shredded all corks. I've bought these corks many, many times and always had great results. They seem to fit perfectly and the quality is good for long cellaring. Great cork. Fits my recycled bottles. The right cork for the right price for me. This is a step up from the glued together cork particle corks. Worked fine in my floor corker. I will buy them again. So far they look nice - Hope to use them when I bottle my next batch. These are quality wine corks and work perfectly with the Italian floor corker and Burgundy and Bordeaux bottles. Exactly what I needed and fast service......HIGHLY recommended!!! I always prefer natural cork. These corks are high quality and arrived very quickly. I will definitely order these again when needed. Some of the corks look like 3's but some look like 1's. Leaving them in the bag till the Malbec comes out of the barrel. Some of the corks look like 3's but some are close to1's. Good value. I'd recommend these corks. Good enough for the home winemaker... no leakers yet! Pretty good corks in small quantity for small batches. If you have a quality floor corker (Italian or Portuguese)you should not have a problem. I have never soaked a cork and have had good results. Very few issues with TCA. I may have either soaked them too long (30 min) or my corker is super cheap, but they broke up a little inside the bottle. Hard to give friends a bottle when there are chunks of cork in the bottle. Hello - it is not recommended to soak corks before use. Our corks are gassed with SO2 at the factory and then packaged under a sanitary hepa flow hood so no need to sanitize in any solution. If you are buying this level of cork you will also want to use a floor corker to eliminate any reason to wet them for ease of insertion. Good seal and cannot complain. I found that my metallic cork tool would slightly deform the top of these in the tighter tolerance bottles.